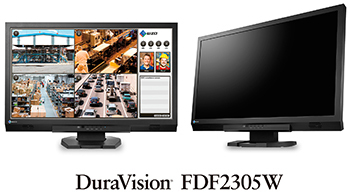 Hakusan, Japan, September 18, 2014 – EIZO Corporation (TSE: 6737) announced the release of the DuraVision FDF2305W, a 23-inch full HD monitor for security and surveillance equipped with EIZO’s Smart Insight visibility-enhancing technology. The 1920 x 1080 full HD native resolution allows it to display images taken with a full HD camera pixel-by-pixel for viewing content in high detail. The monitor is equipped with EIZO’s Smart Insight technology, which automatically detects areas of the screen that are too dark and adjusts the brightness of each pixel. This reproduces highly visible images by brightening dark areas and keeping light areas from becoming washed out. In addition, the monitor also comes with EIZO-patented super-resolution technology, which analyzes the displayed content for noise and blur and sharpens the image. Moving images are displayed clearly with an overdrive circuit that minimizes ghosting and blurring, making it ideal for surveillance applications which require precise observation. The DuraVision FDF2305W uses a mercury-free LED backlight that has minimal impact on the environment when disposed of and consumes less power than CCFL backlights. The LED backlight has a wide dimming range that is adjustable to as low as 3 cd/m2. This makes it more comfortable to use the monitor in dark environments. Safety lock that keep the monitor in place on a desk or other surface. The DuraVision FDF2305W will be available from the end of October. Please contact the EIZO subsidiary or distributor in your country for details.